Almost half of Affluent investors (44 percent) surveyed in August by Spectrem Group, report that international events dominate the news stories most impacting their economic outlook. The percentage is even higher among surveyed Millionaire investors (49 percent). The last time international news had close to this kind of impact on Affluent investors’ economic outlook was in May 2012, which saw in part escalated tension and violence in Syria between government and rebel forces. No other news stories had close to the impact on their economic outlook, Affluent investors reported. Nine percent said that unemployment and stock market conditions each were having the most impact on their economic outlook. Six percent cited the political environment, while 5 percent said news stories about the economy were having the most impact. A mere two percent said that stories about health care were shaping their economic outlook. 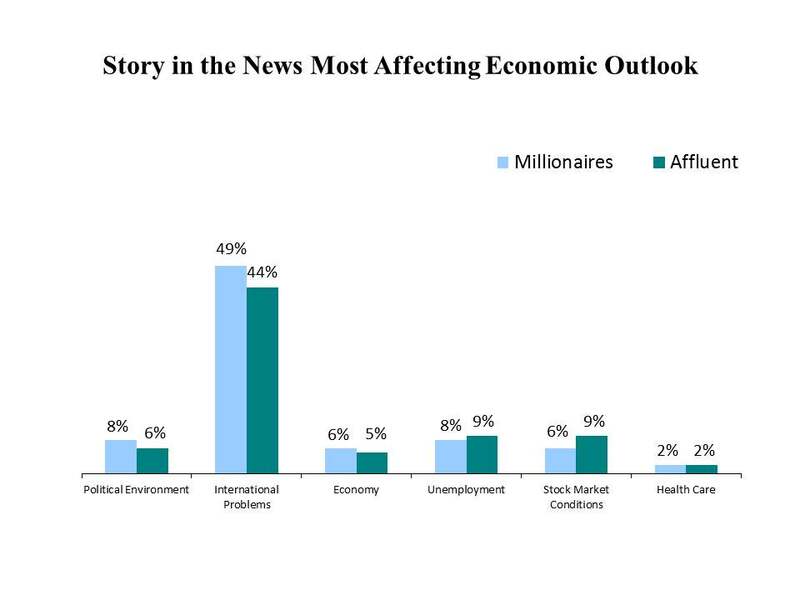 Overall, Millionaire investors are more closely watching news stories about the economy and the political environment than non-Millionaires, while non-Millionaires are more likely than their Millionaire counterparts to say that stories about unemployment and stock market conditions are having the most impact on their economic outlook. International events is the only survey response that increased from three months ago when Millionaire Corner last asked this question of Affluent investors. In that time, there has been renewed Russian aggression against Ukraine, attacks and counterattacks by Hamas and Israel shattering cease fire agreements and deeper incursions into Iraq against the terror group ISIS (this survey was taken before ISIS beheaded an American journalist). U. S. stocks are in the midst of a five-year rally and have surged in the summer’s final weeks. On Tuesday, the S&P 500 topped for the first time the 2,000 –point benchmark. But earlier this month, when the Millionaire Corner survey was taken, the market dipped as concerns grew over international events primarily in Ukraine and the Middle East. The focus on news stories about unemployment is unchanged from last May. The focus on the political environment has decreased the most, from 12 percent to 6 percent.